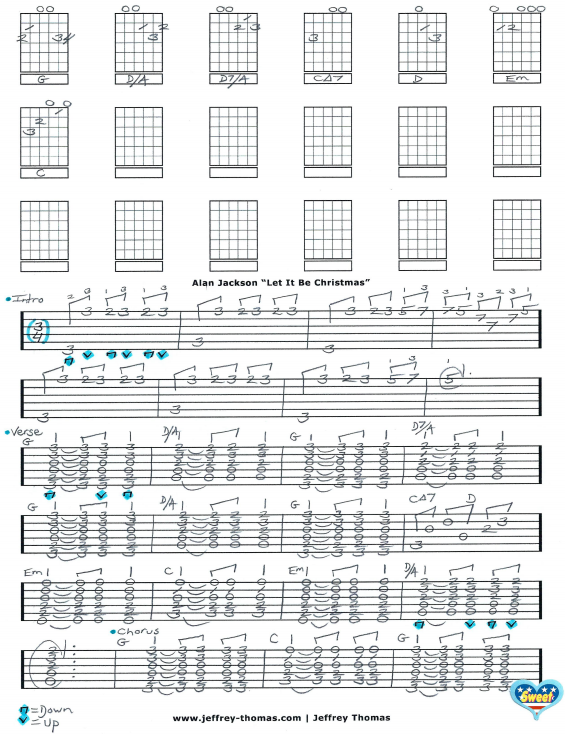 Alan Jackson Let It Be Christmas Free Guitar Tab by Jeffrey Thomas. Learn to play this cool Christmas tune with my free guitar tab. I have created a basic version following the intro, proper chords and strumming from the studio version of the tune. This song is becoming more popular each holiday season and my guitar tab is a perfect sing along style arrangement. Want the guitar tab for free? Just enter your email address in the form provided. Need more help playing this song? Fill out the Schedule A Free Lesson form to set up your free Skype guitar lesson. “Let It Be Christmas” was a Top 40 hit for Jackson on the Country Charts. Make sure to check out more free online guitar lessons on my tab, video and blog pages.